Welcome back. Rest in peace John Dingell, a congressional giant and rapier wit. He played a huge role in the passage of bedrock environmental laws yet also championed the auto industry in key debates. Democrats just gave President Trump the socialism fight he's been spoiling for with the Green New Deal (GND) — which calls for a mammoth expansion of federal investments and market interventions — and the political and planetary stakes couldn't be higher, my colleagues Amy Harder and Alayna Treene join me in writing. Driving the news: 6 announced or potential Democratic presidential 2020 candidates from the Senate — Kamala Harris, Cory Booker, Kirsten Gillibrand, Elizabeth Warren, Amy Klobuchar and Bernie Sanders — are already co-sponsoring the non-binding resolution. The big picture: The GND calls for a World War II-level mobilization to put the U.S. on an aggressive pathway toward reducing greenhouse gas emissions to net zero, while also providing universal health care and a jobs guarantee (among other goals). "Meeting 100 percent of the power demand in the United States through clean, renewable, and zero-emission energy sources," while cutting emissions from transportation as much as technologically possible. "Upgrading all existing buildings in the U.S. and building new buildings to achieve maximum energy efficiency..."
What they're saying: Via a piece by Axios' Mike Allen, Jonathan Swan and Alayna, everyone in Trump's orbit — the White House, the campaign and the outside political advisers — are thrilled that so many of Trump’s potential 2020 opponents are endorsing the GND. The Republican political machinery immediately went after the plan. The Republican National Committee called it a "socialist wish list" with huge costs. Sen. John Barrasso, who's in GOP leadership, knocked the "socialist manifesto that lays out a laundry list of government giveaways." 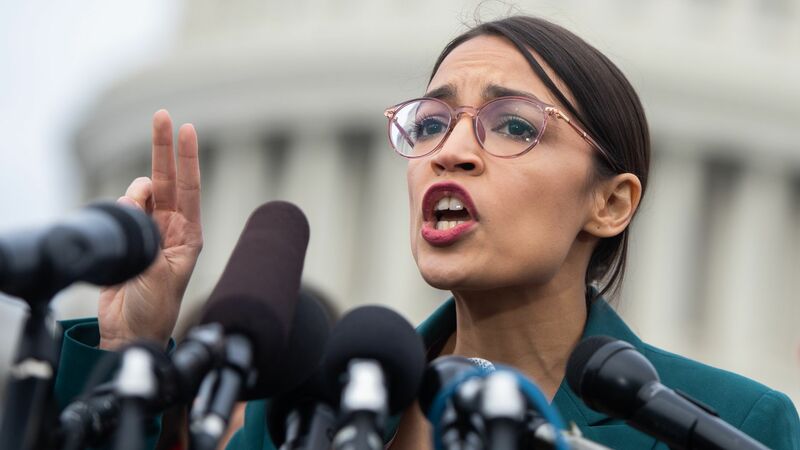 “Every Republican in the country should get on their hands and knees and thank Alexandria Ocasio-Cortez," former White House official Andy Surabian told Axios. Quick take: It's tough to say whether there's truly jeopardy for Democrats, or whether the GND — which is both a sweeping economic plan and a climate policy template — could instead be a political winner. I'll be curious to see what the next waves of polling bring now that it has broken into the political mainstream and Republicans are on the attack. Until yesterday, Gillibrand, Booker, Warren, Harris and Klobuchar hadn't made climate change central to their political careers. Now they comprise roughly half of the initial Senate cosponsors of what's by far the most sweeping and aggressive global warming template ever proposed on Capitol Hill. Why it matters: It's a testament to the meteoric rise of the GND concept. But I think there's also raw and delicate politics at play. AOC and her allies are a force in Democratic politics and they're already affecting the 2020 race. The bottom line: Any hesitation these 2020 candidates might have about embracing the proposal are simply overwhelmed by the nearer-term political downside of getting on the wrong side of the progressive orbit ahead of the primaries. Axios Expert Voices contributor Robert Johnston writes ... Amid the announcement of GND resolution yesterday, critics have been quick to characterize the policy as quixotic and extreme. But GND supporters are far from alone in advocating for a radical transformation of the global energy system, nor are such efforts confined to the left wing of the Democrat congressional caucus. Between the lines: Corporations from Walmart to Toyota are already investing in restructuring their businesses toward GHG reductions and a longer-term sustainable energy model. Similarly, major energy-consuming and energy-producing governments such as Germany, China, and even Saudi Arabia are pursuing their own versions of risk management and economic transformation in anticipation of rapid decarbonization. None of these government or corporate efforts are as aggressive as the GND, but as a result are unlikely to deliver GHG reductions at a level consistent with the Paris Agreement or similar targets. Johnston is managing director for global energy and natural resouarces at Eurasia Group and a senior fellow at the Atlantic Council Global Energy Center. Axios' Steve LeVine reports ... On the coast of South America, just north of Brazil, lies the obscure and impoverished former British colony of Guyana, distantly remembered for a bizarre mass suicide four decades ago that begot the term "drinking the Kool-Aid." But today, the discovery of a massive trove of oil off its shores, including 2 finds just this week, put Guyana on the cusp of becoming one of the world's wealthiest nations, in the league of petro-states like Qatar. Exxon plans to begin producing 120,000 barrels per day next year, and to bump that up 6 times to 750,000 by 2025. Amy writes ... A small bipartisan group of lawmakers introduced legislation Thursday that would support the buildout of technology capturing carbon dioxide emissions. Why it matters: Although it’s not nearly as high-profile or sweeping as the GND resolution that was also unveiled Thursday, the bill takes a more direct, concrete aim at the root of climate change — the emissions themselves. Details: Senate Environment and Public Works Committee chairman Barrasso and the panel’s top Democrat, Sen. Tom Carper (D-Del. ), led the group introducing the bill, which supports the technology by ensuring coordination among federal agencies to develop pipelines to move the captured CO2 emissions, among other things. Barrasso likes the bill because it helps ensure use of U.S. fossil fuels in a world addressing climate change, while Carper said the technology is essential to cutting emissions. The bottom line: They’re both right. The world remains heavily dependent on fossil fuels, so making them cleaner is key to addressing climate change. That’s why this technology is both essential and a rare bipartisan policy. Flashback: The bill passed the same committee last year, but didn't make it through the Senate before session ended. Between the lines: The GND is agnostic on whether it supports carbon capture technology, despite scientists saying it’s essential. An earlier version backed by AOC appeared to endorse it, but that language is now gone. It’s an indication of the internal disagreements between factions on the left over this tech, given that it supports fossil fuels. Chevron is setting new targets to curb reductions of the powerful GHG methane and tying bonuses for thousands of employees to the company's results. Why it matters: It's the latest example of Chevron, which in the past hasn't been as active on climate as European-based giants like Shell, stepping up its efforts. By the numbers: The company said it's aiming to cut methane emissions intensity from oil-and-gas production (that is, emissions per unit of output) by 20%–25% by 2023. The same plan announced Thursday seeks to cut the intensity of flaring (i.e. burning) of methane by 25%–30% over the same period. But, but, but: "[T]he reduction targets won’t apply to emissions created by consumers using Chevron products, a key demand from environmentalists and activist investors," Bloomberg notes. Reuters writes, "Chevron, though, does not address reducing the company’s full carbon footprint, said Danielle Fugere, president of investor group As You Sow, and so 'will not achieve the reductions needed to stabilize the climate and reduce growing economy wide and thus portfolio wide risk to investors.'"